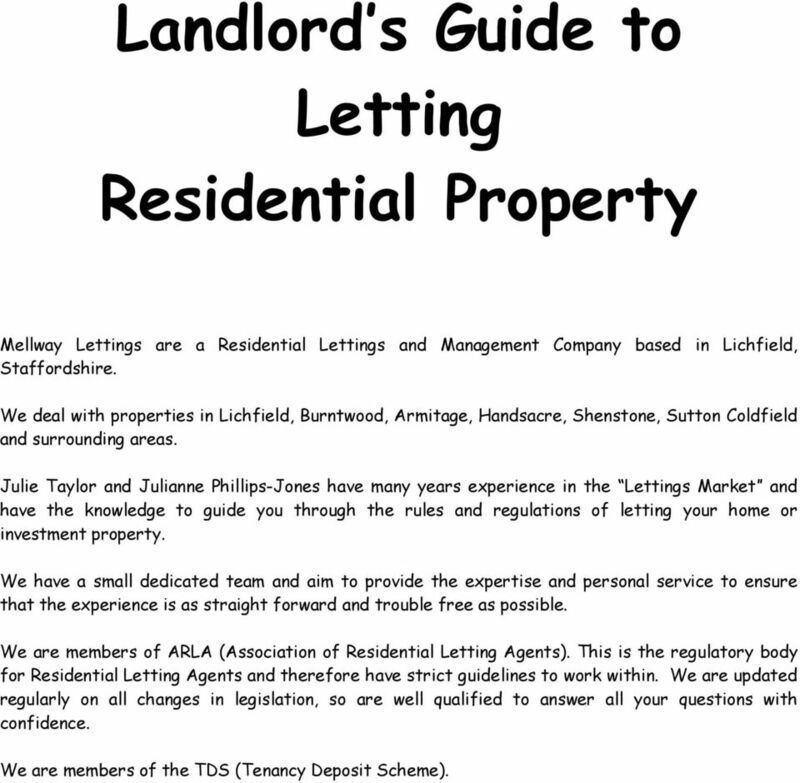 Download "Landlord s Guide to Letting Residential Property"
1 Landlord s Guide to Letting Residential Property Mellway Lettings are a Residential Lettings and Management Company based in Lichfield, Staffordshire. We deal with properties in Lichfield, Burntwood, Armitage, Handsacre, Shenstone, Sutton Coldfield and surrounding areas. Julie Taylor and Julianne Phillips-Jones have many years experience in the Lettings Market and have the knowledge to guide you through the rules and regulations of letting your home or investment property. We have a small dedicated team and aim to provide the expertise and personal service to ensure that the experience is as straight forward and trouble free as possible. We are members of ARLA (Association of Residential Letting Agents). This is the regulatory body for Residential Letting Agents and therefore have strict guidelines to work within. We are updated regularly on all changes in legislation, so are well qualified to answer all your questions with confidence. We are members of the TDS (Tenancy Deposit Scheme). 2 FULLY MANAGED SERVICE Advertising with exterior photograph Web site coverage, Rightmove and On The Market Viewing service for prospective tenants Vetting of tenants Preparation of Tenancy Agreement Preparation of detailed Inventory and Photographs Set up of standing order for rental payments Read meters and transfer utilities into new occupiers names 2. Management of Tenancy Regular property checks Collection of rental Monthly payment of rental and detailed statements Deal with all maintenance items Tenants Security Deposit held in the Tenancy Deposit Scheme (TDS). 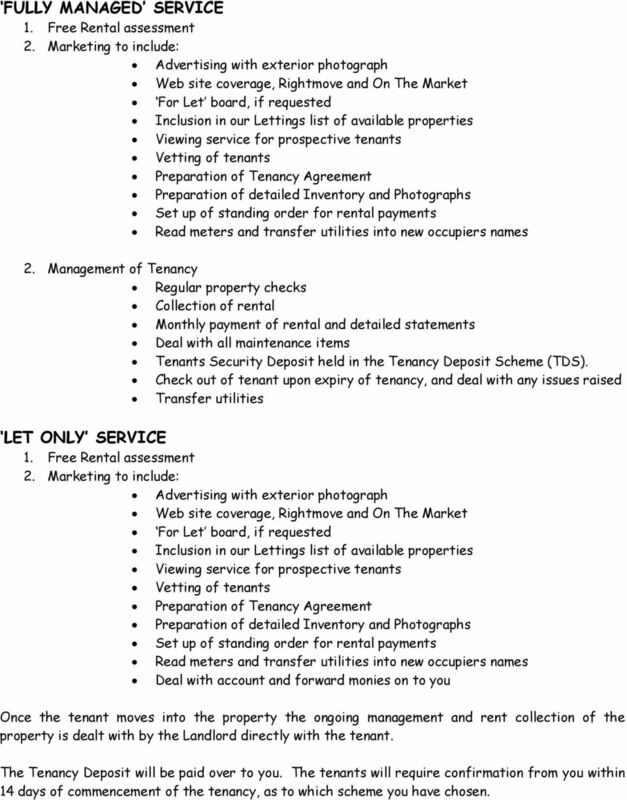 Check out of tenant upon expiry of tenancy, and deal with any issues raised Transfer utilities LET ONLY SERVICE Advertising with exterior photograph Web site coverage, Rightmove and On The Market Viewing service for prospective tenants Vetting of tenants Preparation of Tenancy Agreement Preparation of detailed Inventory and Photographs Set up of standing order for rental payments Read meters and transfer utilities into new occupiers names Deal with account and forward monies on to you Once the tenant moves into the property the ongoing management and rent collection of the property is dealt with by the Landlord directly with the tenant. The Tenancy Deposit will be paid over to you. The tenants will require confirmation from you within 14 days of commencement of the tenancy, as to which scheme you have chosen. 3 TENANT FIND Advertising Web site coverage Referring prospective Tenants directly to you Tenancy Agreement Service We can prepare Tenancy Agreements for Landlord s for their own tenants. Once you have made your decision to Let your property. We can guide you through the various stages and these are some of the questions commonly asked WHAT SHOULD I LEAVE IN THE PROPERTY? Unfurnished Carpets, curtains and light fittings and a cooker are required. We would recommend that you provide plumbing for a washing machine as a minimum. If kitchen appliances are provided this can aid the letting, but you must be aware that anything you leave must be maintained. We would also suggest that you provide a lawn mower and garden equipment if you wish the tenants to maintain the garden. The provision of a shower, either over the bath or separate cubicle is essential. Furnished Provide basic items of furniture. E.G. sofas, tables, chairs, beds (with mattress covers) chest of drawers, wardrobe, kitchen appliances etc, subject to the following regulations. We would recommend that you remove all personal items, e.g. china, pictures and linen. TV s and videos need to be removed as they can be costly to repair. WHAT SPECIFIC REGULATIONS COULD AFFECT ME? Regulations are constantly changing particularly with regard to safety. Currently these cover 1. Furnishings Soft furnishings, i.e. mattresses and bases of beds, sofas and cushions all need to comply with fire regulations. 2. Gas installations A Gas Safety (Installation and Use) Regulation Certificate 1994 is required prior to the tenant taking occupation and is renewed on an annual basis for the gas supply and appliances. This must be carried out by a GAS SAFE registered engineer. Mellway Lettings are able to organise this for you. 3. Electrical installations The Electrical Equipment (Safety) Regulations 1994 impose an obligation on the Landlord to ensure that all electrical appliances, cabling, fuses and plugs are tested, by a qualified electrician. Mellway Lettings are able to organise this for you. 4. Smoke Alarms A smoke alarm, battery or mains operated should be fitted on each floor. 5. Energy Performance Certificate With effect from 1 st October 2008, it is a legal requirement to obtain an Energy Performance Certificate prior to marketing a property available for Let. Mellway Lettings are able to organise this for you. 4 6 Legionella Disease A Legionella Risk Assessment is required due to the The Health and Safety Executive, April Mellway Lettings are able to organise this for you. WHAT CAN PROTECT A LANDLORD? 1. Contents and Buildings Insurance It is essential that you maintain the buildings insurance on your property and that the insurers know that it is going to be let out. Minimum contents insurance is recommended. We have access to products specifically designed for rental properties. Please ask for further details. 2. Rental and Legal Protection Mellway Lettings can arrange this for you if required. Although we make every effort to ensure that tenants are vetted carefully, unfortunately tenants can fall into difficulties for various reasons, long term illness, redundancy, relationship breakdown. We would recommend that you consider rental and legal protection for this particularly if you rely on the rental for a mortgage on the property. HOW LONG IS A TENANCY AND WHAT IF THE TENANT WANTS TO EXTEND THE TERM? 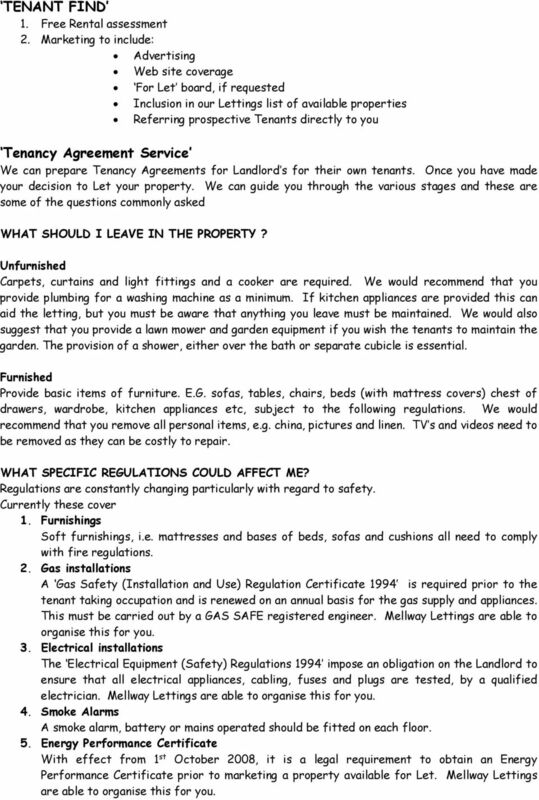 Assured Shorthold Tenancies under the Housing Act 0f 1988, are usually for a fixed 6 or 12 month period. After the initial term if may be agreed between the Landlord and Tenant to extend the term for another fixed period, or to roll on the tenancy on a month by month basis, whereby the tenant gives one month s notice to vacate and the landlord two months notice on a rental payment date. DO I NEED AN INVENTORY? These are essential and it is recommended that an inventory is made by a letting agent to avoid omissions or errors. They should always be made at the start of the tenancy to identify missing items, breakages and damages, at the end the Tenant is liable. Mellway Lettings will also take photographs of relevant items to attach to the inventory. 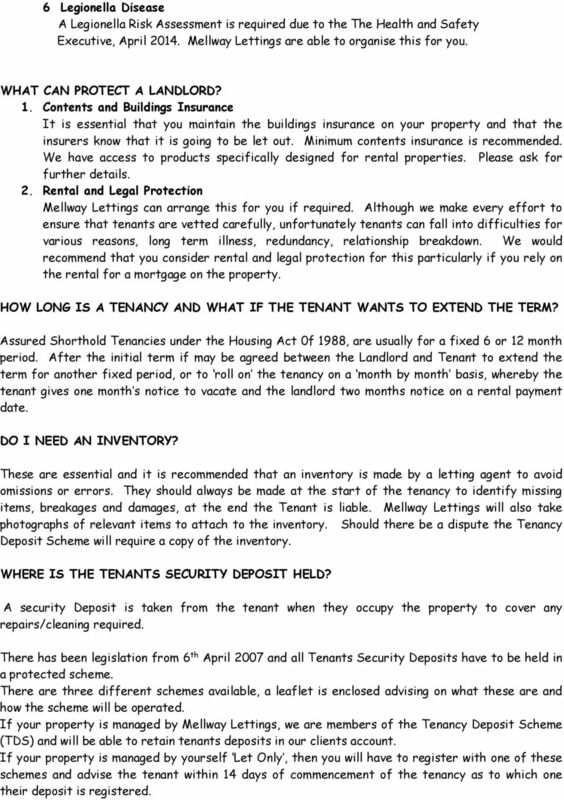 Should there be a dispute the Tenancy Deposit Scheme will require a copy of the inventory. WHERE IS THE TENANTS SECURITY DEPOSIT HELD? A security Deposit is taken from the tenant when they occupy the property to cover any repairs/cleaning required. There has been legislation from 6 th April 2007 and all Tenants Security Deposits have to be held in a protected scheme. There are three different schemes available, a leaflet is enclosed advising on what these are and how the scheme will be operated. If your property is managed by Mellway Lettings, we are members of the Tenancy Deposit Scheme (TDS) and will be able to retain tenants deposits in our clients account. If your property is managed by yourself Let Only, then you will have to register with one of these schemes and advise the tenant within 14 days of commencement of the tenancy as to which one their deposit is registered. 5 WHO ELSE NEEDS TO BE ADVISED THAT I AM LETTING MY PROPERTY? Building Society/Lender Managing Agents (for Flats/Maisonettes) Telephone provider Insurance Companies IS LETTING SAFE? Yes, it is safe provided the Tenancy Agreements are properly drawn up and the correct notices served. If legal action is then needed for repossession the Court should make an order in the landlord s favour. New accelerated Court procedures do away with the necessity for a hearing and take the hassle out of this very occasional problem. Solicitors have to be instructed, Rental and Legal Insurance would cover loss of rental, subject to the policy. WHAT ONGOING EXPENDITURE CAN I EXPECT? The Tenants are responsible for keeping your property in good order and in clean condition. However, it may be necessary from time to time for you to undertake re-decorations, replacement of carpets due to normal wear and tear to keep the property to a good standard. Large trees, shrubs and hedges fall outside of the responsibility of Tenants and may need a seasonal cut back. www.bennettresidential.co.uk Letting your property with Bennett Residential Your letting made simple! www.bennettresidential.co.uk Letting your property with Bennett Residential Your letting made simple! Letting your property Thank you for the excellent work carried out thus far on my property in the UK. The genuinely helpful lettings agent. 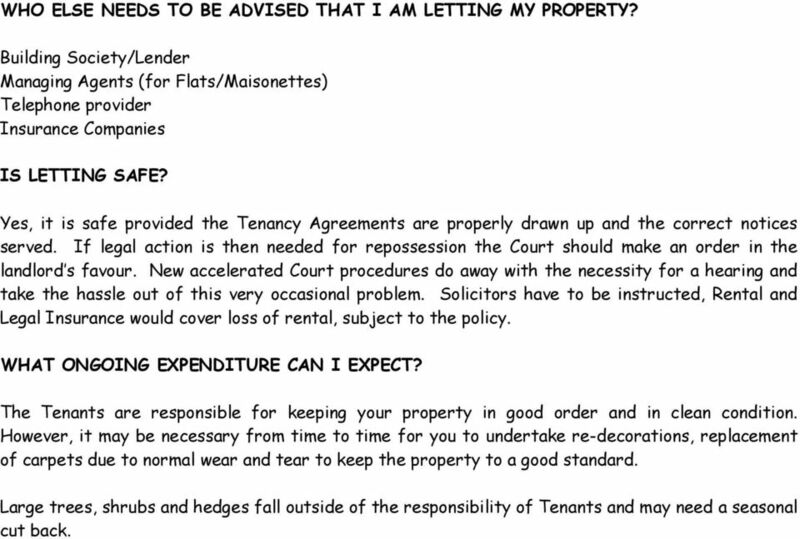 LANDLORD LEAFLET. Information & Guide for Prospective Landlords ARE YOU THINKING OF LETTING YOUR HOUSE, FLAT, BED-SIT OR HOLIDAY HOME? Mortgages. Becoming a Landlord. Things to consider before becoming a Buy to Let Landlord. Local knowledge. Mutual understanding. What is buy-to-let? Buy-to-let refers to the purchase of a property specifically with the intention of renting it out. AGENCY AGREEMENT. Between 3Keys Limited company registration number 06841492 6 of Town End Doncaster DN5 9AG ... ... ... ... ... Postcode..
Do you have an empty property on your hands in need of repair?